Some compositions using high frequency event sources returns high CPU usage and fast fans spinning on my i5 2,5 4go ram. Regarding "scrolling the editor is laggy", is it smooth for small compositions, and only laggy for large compositions? Or if not, when do you notice it the most? Regarding "receive composition frame turns the fans on", are you saying that every composition is using a lot of CPU time (I'd be surprised since your computer is faster than mine, and Vuo's example compositions rarely use much CPU on my system), or does it depend on what nodes are in the composition? Maybe there is a specific node that we could optimize? We're constantly working on live-coding performance improvements; you should see a difference in the upcoming Vuo 1.1.0 release. One screenshot with OSX's activity monitor app and one with the istats app. That particular composition isn't designed as efficiently as it could be — instead of querying Check Mouse Status every frame, it could use Receive Mouse Moves which only fires an event when the mouse actually moves. We'll get that fixed. On my system, it uses about 35% CPU. I was surprised to see so much CPU taken just from rendering the one layer every display refresh, but it looks like that's the base cost, and adding more layers to render is not so expensive (adding a couple additional Make Text Layer nodes, CPU only went up a few percent per layer). In general, we've put a lot of effort so far into making Vuo compositions execute as fast as possible, and haven't focused much on energy efficiency / avoiding doing work unless absolutely necessary. Improving energy efficiency is on our radar (especially when we start working on support for mobile devices). Not all compositions using "requested frame" as value use that much CPU with fans on. Thanks for clarifying. I ran some performance profiles on those 3 compositions, and filed a few internal bug reports toward improving CPU efficiency for them. Tentatively planning to dig into that just after the Vuo 1.1 release. Updated title and converted to bug report. I've been using Vuo on another computer this Week and I had so much fun using it without the fans on that I thought I should document this bug a little more. So when my MBP 2011 uses frequently updating nodes it gets a high CPU usage and the fans turn on for the whole time of use. So this is not a specific bug to the "Show mouse position" example composition. Requested frame from Render X to window (to a curve time input for example) . However it does not happen when no "Render X to Window" node is used. So if no Window is piped-up, like the "Play Audio File and Loop" example (stays at 20% CPU). Anyway ... I noticed the fans on my computer go crazy quite often, not only in Vuo. For example sometimes even when I browse pages. So it has some Apps Like Safari, Vuo, Numbers it doesn't like. I don't know if it is because of High CPU usage, or because of heat CPU. I don't know if the heat sink/cooler could be broken. 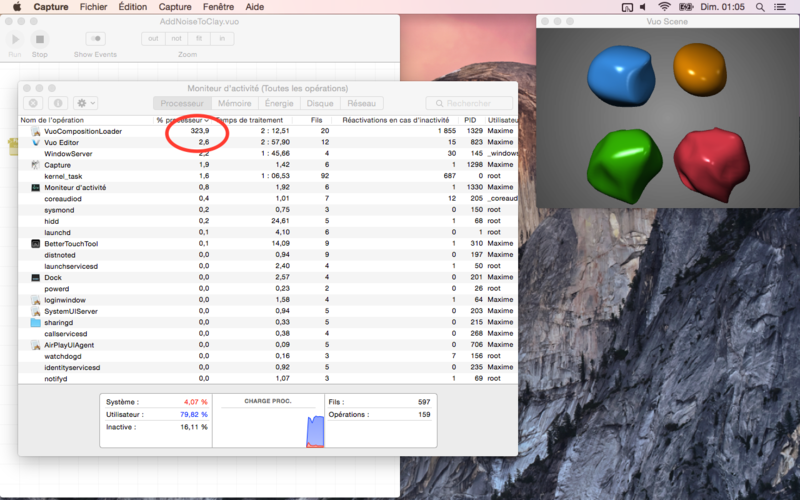 Just to say even if I get that 300% CPU sometimes in Vuo, my Mac surely has a problem itself ! I don't know if it is because of High CPU usage, or because of heat CPU. Bodysoulspirit, have you tried MenuMeters? It displays CPU usage in your menu bar. I did not know MenuMeters. Thanks. I had Fan Control & Another CPU stat App. Here are screenshots of the idle computer and when running Add noise to clay. But as said, my computer may have itself a problem, and Add noise to clay is not the issue itself I think as many compositions do use high CPU. I will try to investigate more and isolate some stuff to document the bug here. Bodysoulspirit, could you make a time sample for us? That may help us figure out what's going on. 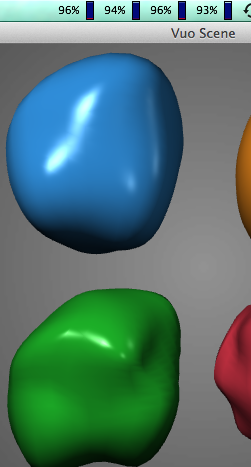 In that composition, Vuo is applying GPU-based mesh filters. Unfortunately the Intel HD Graphics 3000 GPU isn't very powerful, so it may be resorting to using the CPU instead of the GPU, which really slows things down. In Vuo 1.2, we've already made a bunch of CPU and GPU performance improvements, so that may help with some compositions. But for graphics work we recommend using a system that has a discrete GPU (most recent Macs include a discrete NVIDIA GPU). Here it is. Hope I did the right thing. It's done in OSX 10.9 please tell me if you'd like 10.10 sample too. 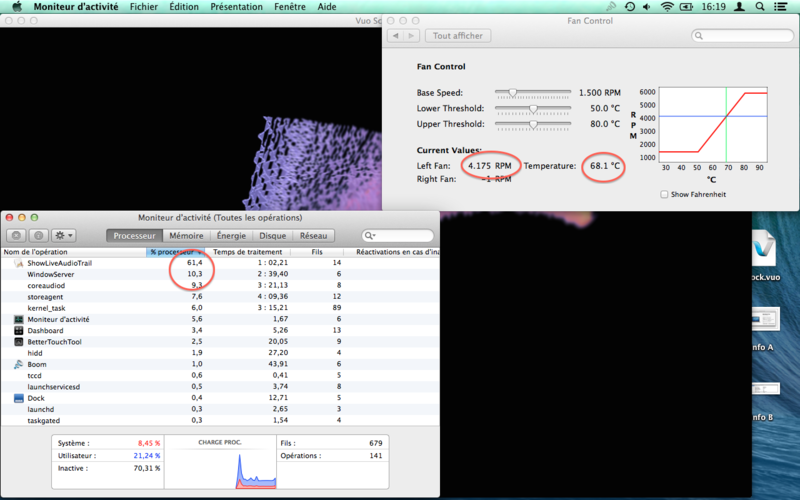 Holy **** I must buy a new Mac ;) But I'm the only guy who reported this high CPU + fan thing here around ? Thanks for the time sample. Thanks for the time sample. I skimmed through it, and, yes, it appears that the mesh filters that are supposed to be running on the GPU are falling back to use the CPU instead (which will be much slower and, of course, more CPU-intensive). We don't have an Intel HD 3000 system to test with. We do have a few Intel HD 4000 systems, and I just confirmed that AddNoiseToClay is not falling back to CPU on that system configuration. I'm not aware of a way to figure out why it's falling back to CPU on Intel HD 3000 or what we can do to stop it. The only Apple documentation I've found is QA1502, which just says it switches to CPU "when the hardware resources are not sufficient for a given operation". But as said, perhaps the computer itself has got a problem ! Thanks for the time token anyway. Which devices and protocols would you like Vuo to support next?